Charles Colledge produced some really beautiful photographs for postcards of Matlock and this is no exception. 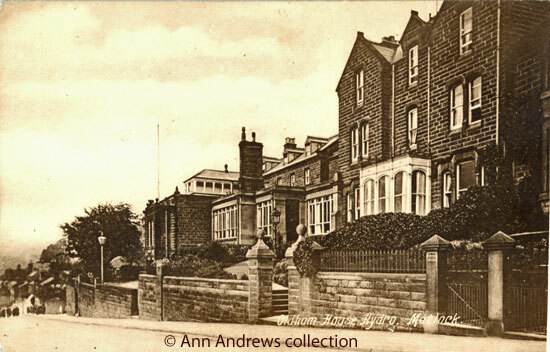 Here is Oldham House in the inter war years, at the time run by Lubin George Wildgoose. Lubin Wildgoose was a grandson of Thomas Davis, one of the founders of the hydropathy industry in Matlock, and he followed on from his parents at Oldham House. He had married Jane Ellen Barnsley at the Primitive Methodist Chapel on Matlock Bank in 1898 and the couple had one son, Harold Davis Wildgoose. Lubin George was elected onto Matlock Urban District Council and eventually became Chairman. He was also very musical, singing in local choirs and playing the double bass. About 1900 his hydro became the first place in England from which music was transmitted over the telephone. There had been a musical competition practice at Oldham House one evening, after which the four members of the Male Voice Quartet remained behind to enjoy what was described as a quiet smoke. L. G. Wildgoose had arranged to speak to his brother, who was living in Oldham, about 11p.m. The group decided to give his brother a quick concert so crowded into the hydro's telephone box, closing the door firmly to avoid disturbing the visitors and servants. At the end of the impromptu recital they received praise from an unexpected quarter as the operator had been listening in. "Well I'm d------. I never heard anything like that over a telephone afore. Goodnight, lads, and good luck". The vehicle's registration was BU 2137 so we know it was registered in Oldham ; although it could have belonged to a guest it would be nice to think it just might have belonged to Edmund Wildgoose, Lubin's brother. (just above the ball-head finials of the central entry posts) on both images is about the same. the small crowd of people (bottom left) walking up the hill from the tram depot. Over the years the hydro provided hospitality to individuals and large groups, including hosting conferences. In the pre Christmas period of 1928, for example, Derby County Football Club were amongst the guests at Oldham House. They seem to have trained there on numerous occasions over the years. The Derbyshire Scouters held their annual weekend conference there a couple of months before. Over 100 Derbyshire Scout officers and lady cubbers attended. Although the outbreak of the Second World War saw the end of hydropathy at Oldham House, the Oldham House & Prospect Place Hydropathic Company Limited was not voluntarily wound up until an Extraordinary General Meeting on 21 April 1959. Harold Wildgoose was then Chairman and Kenneth MacNeill Black of the firm Mills & Black was appointed Liquidator. "You would like it here there is always some sort of entertainment during the evening after dinner." 1. "Oldham House, Matlock", published by Charles Colledge, Matlock. Posted 23 Ap 1924 to Miss H Wide, Devon from Ivy, who was staying at Oldham House. 2. 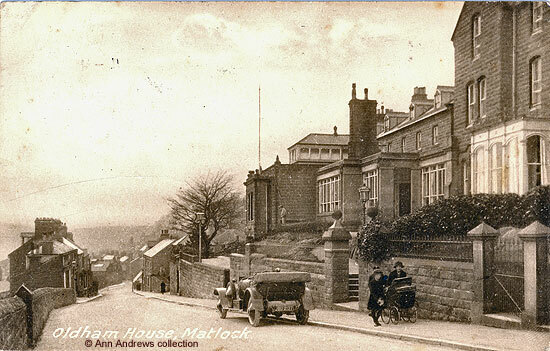 "Oldham House Hydro, Matlock". Published by S. Dakin, Tobacconist, Stationer and Hairdressing Salon, Smedley Street. No.11133..1848. Printed in England. Unposted. There is a VL where stamp should go. See the 1891 census | the 1901 census | Kelly's 1912 Directory (under Oldham House) | Kelly's 1916 Directory (under Oldham House). He is mentioned as a local councillor in Kelly's 1912 Directory and Kelly's 1916 Directory, under "officials". He went on to be Chairman of Matlock Urban District Council between 1932 and 1938. His name is on the Coronation Medal. He was a member of Matlock Bank Primitive Methodist Church, 'Young Mens' Class | Matlock Primitive Methodist Prize Choir. Julie Bunting's book "Matlock and Matlock Bath" has a photograph of him as a member of Matlock Brotherhood Orchestra. "Derby Daily Telegraph", 6 April 1926. The four in the phone box were Herbert Ballington (the informant), Wilfred Dean, Ted Slater and L. G. Wildgoose. The man they were entertaining in Oldham was Lubin George's brother, Edmund who had lived in Oldham for much of his working life. "Derby Daily Telegraph", 24 December 1928. "Derby Daily Telegraph", 2 October 1928. Three notices were published in "The London Gazette", two on 5 May 1959 and the final one on 21 August 1959.